I have a soft spot for thumb wars. My significant other and I played it endlessly in the beginning of our relationship (I wanted to win. He—I found out later—just wanted to hold my hand :) This great handmade book by John Hersey is a fun tribute to this ancient form of "warfare." Go to his Etsty store and get a brief education on how thumb wrestling came to be (e.g. brought to the West by Marco Polo and used to determine who was going to sleep with the most popular concubine?!) 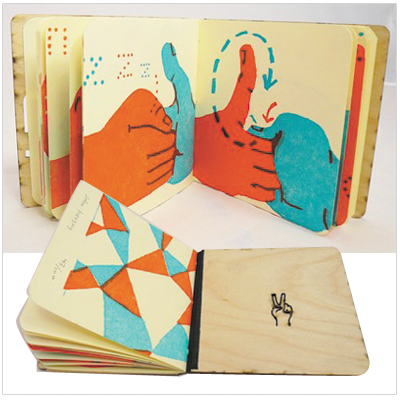 Letter-pressed and bound with either laser cut plywood or chipboard. 100 editions total.